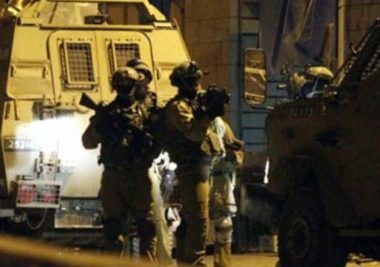 Israeli soldiers abducted, Tuesday, two Palestinians from their homes, in Hebron governorate, in the southern part of the occupied West Bank. The Hebron office of the Palestinian Prisoners’ Society (PPS) has reported that the soldiers invaded and searched homes in Bani Naim town, east of the city, and abducted Mohammad Fayez Zeidat, and Naim Hashem Irmeilat. It added that the soldiers also invaded Beit Kahil town, west of Hebron, and searched several homes, including the home of a former political prisoner, identified as Abu Hamza Zohour. The soldiers also summoned for interrogation Ehab al-Qawasma, after invading his home in Hebron city. In addition, the army installed roadblocks on Hebron’s northern and southern roads, in addition to the entrances of Sa’ir and Halhoul towns, before stopping and searching dozens of cars, and interrogated many Palestinians while inspecting their ID cards. In related news, the soldiers abducted three Palestinians, and summoned two others, for interrogation, after invading their homes in Bethlehem, in the occupied West Bank.